Hout Bay with the Sentinel in the background. Back in 1781 the Cape Colony was just over a 100 years old. The Cape had a thriving trade with passing ships and Table Bay was an important stopover for supplies for ships sailing around the tip of Africa to the east. It was also a time of war in the world. The American War of Independence” was raging and the British and French were also at each others throats. Authorities at the Cape knew that due to the poor defences at the Cape any power could just sail into Cape waters and take over the sea route to the East. 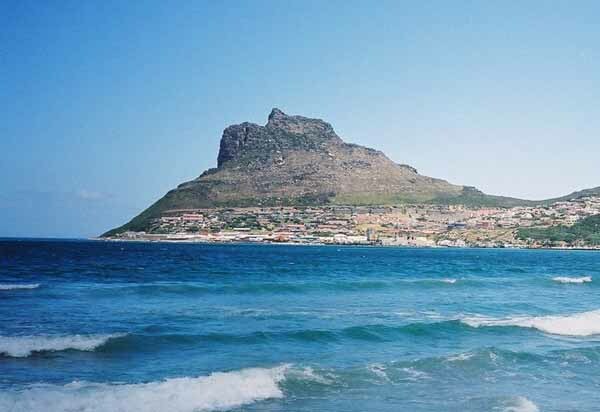 Defences of Table Bay were adequate but Hout Bay and False Bay were considered the soft under belly to the defences of the Cape. Any ship could enter these two bays and land troops which could take over the Cape with little resistance. The Political Council became extremely worried on the 31st March 1781 when news reached them via the French ship Sylphide, that war had broken out between the Netherlands and Great Britain. 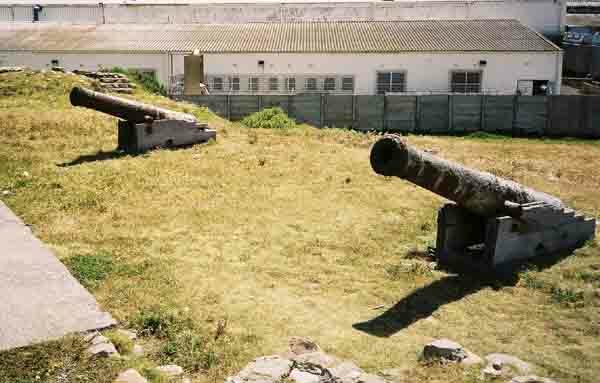 After a meeting of the Political Council in May 1781 and at the instigation of the Governor J. van Plettenberg it was decided to build a twenty cannon battery at the western entrance to Hout Bay. Major Gilquin a fortifications expert and Pieter Cloete an engineer were roped in to build the battery.This they did with the help of slaves and fortification workers. The battery was designed as a conventional zig-zag battery with stationary gun emplacements. In July 1781 this battery was given its first test when four ships sailed into the bay to shelter from Admiral Johnstone's fleet who were persuing them.Admiral Johnstone lead a British fleet to the Cape to take it over but found that French ships had been sent to the Cape to bolster its defences. As was the case in those days if you cannot carry out your main task then capture the shipping belonging to the enemy as your prize.This the admiral had done with great success when he captured a number of Dutch ships in Saldanha bay. The ships anchored in Hout Bay were richly laden East Indiamen. After patrolling the entrance to Hout Bay for a number of days a frigate belonging to Johnstone's fleet entered the bay and sailed to within shooting distance of the ships anchored in the bay from where it studied the defences on the shoreline. The frigate then left the bay and went to report its findings to the Admiral. The Admiral decided that it was not safe to continue the chase so sailed away leaving the battery with its first success without having fired a shot. 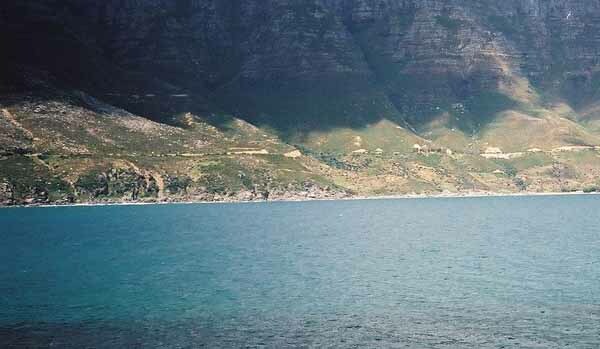 The east battery was sited on the lower slopes of the Hout Bay mountains where it can still be found today. At about the same time it was decided to build a battery on the eastern side of the bay . This was done in the period 1781-1783. People are not sure of the exact dates of the building of the battery. Both batteries however were equipped with 35 pieces of 24-pounders. (whatever that means). In my understanding they are cannon which fire 24 pound cannon balls. The east batteries' cannons were also aimed at the entrance to the bay. Llandudno was also considered a threat so a third battery was built high up on the slopes where one today exits Hout Bay to drive around Chapman's Peak. This battery was placed there to protect the backs of the east and west batteries and contained six 12 pounder cannons. These cannon would have had a devastating effect on enemy shipping should they have been called upon to fire on them. The bay is reasonaby small and a ship caught in the cross fire of these cannon would have nowhere to run and hide. Both east and west batteries are still there today. The west has four cannon pointing out to sea while the east batteries cannons are being refurbished. It is interesting to see how the old strategies worked and how effective they might have been had they been called into battle.